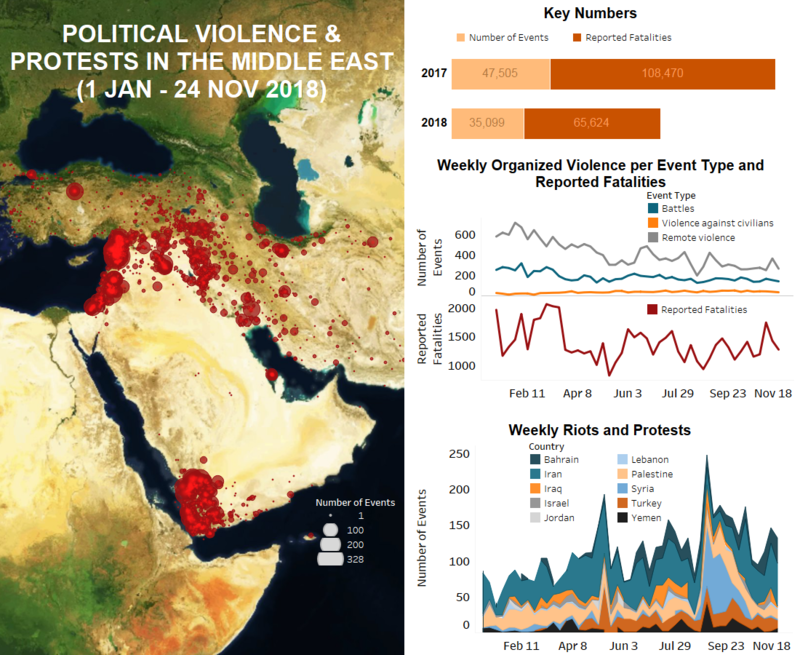 Throughout the Middle East region last week, there was a significant decrease in both reported fatalities and remote violence events, the latter of which can be partly explained by the ceasefire along the Gazan border. Demonstrations have also decreased throughout the majority of the region, with the exception of in Bahrain, where both riots and protests increased as a result of opposition to the 24 November election. Elsewhere, battles continue along their respective fronts in Syria, Yemen, Iraq, and Turkey, while in Iran labour demonstrations continue with no end in sight. In Palestine, the most recent ceasefire agreement between Israel and Hamas/Palestinian Islamic Jihad (PIJ) appears to be holding, following large-scale rocket exchanges and related demonstrations in both countries the week before. However, last week there were a number of reports of violence against civilians by Israeli military forces in Palestine – both against farmers and during raids. In Gaza, the Great Return March demonstrations on Monday and Friday were quiet in comparison to prior weeks. A number of injuries were reported as a result of clashes, but no fatalities. In the West Bank, demonstrations, “price tag” attacks – acts of violence and vandalism by Israeli settlers targeting Palestinians – and home demolitions were the most prevalent and frequent events. There was also a non-fatal stabbing carried out by a Palestinian against an Israeli settler in Bayt Jala. In Israel, demonstrations against Prime Minister Netanyahu and the 13 November ceasefire have seemingly stopped for now. The fragile governing coalition has so far held together, although there will be elections in 2019 (Haaretz, 19 November 2018). In Lebanon, there were protests held by two of the most active groups in Lebanon: environmental activists and Palestinian refugees. Activists and citizens from Hoch-Rafika village and the surrounding area staged a sit-in along the international Riyak-Baalbek highway in protest against the delay in solving the Litani River pollution case. The Litani River is severely polluted and citizens feel that the situation is not being adequately addressed by the government. There was additionally a protest held by Palestinian refugees in front of the Office of the Director of UNRWA services in Ein El Helweh Palestinian refugee camp to demand more financial assistance, health care, and food. UNRWA has been struggling to cover its expenses since the US ended funding to the organization at the end of August (Washington Post, 31 August 2018). In Iran, hundreds of workers in Haft Tapeh Sugarcane Company in Shush and National Iranian Steel Company in Ahvaz continued to demonstrate for a third week against unpaid salaries, job insecurity and the mismanagement of their companies. Protesters in Shush also called for the release of their co-workers, arrested for protesting. In several cities across Iran, workers, teachers, and students held rallies to express their support for the workers in Shush and Ahvaz. In Bahrain, last week, there were dozens of protest demonstrations and riots by groups calling for the boycott of the Parliamentary elections, which were held on 24 November. Last June, King Hamad signed legislation which disqualified opposition candidates from the elections by banning anyone who belonged to a dissolved political organization or who was previously convicted and sentenced to more than six months in prison. Bahrain’s main Shiite opposition group, Al-Wefaq, whose most prominent figures are exiled or serving lengthy prison sentences, called for a boycott and urged their supporters to abstain from voting (Middle East Eye, 24 November 2018). In Turkey, former public workers continued their ongoing protest in Ankara to demand that they be given their jobs back. They were earlier dismissed under legislative decrees as a result of the post-coup purge. In Istanbul, the Saturday Mothers gathered in the Taksim area of Beyoglu as part of their weekly demonstration to demand the return of people who have gone missing while under detention. In the southeast, there was a significant decrease in clashes between Kurdistan Workers Party (PKK) militants and Turkish forces, with airstrikes only being reported across the border in Iraq. PKK militants were targeted by Turkish airstrikes in the mountainous regions of Dahuk and Erbil governorates. Turkish attacks into Iraqi Kurdistan are common, as PKK is known to use the area as a base of operations. Elsewhere in the country, Islamic State (IS) IEDs targeted both Iraqi military as well as civilians throughout the country, particularly in Ninewa governorate, where a vehicle carrying students was hit in the Shurah area and four people were reportedly killed. Last week in Yemen, there was a decrease in violence along most of the major battlefronts, coinciding with the visit of UN envoy Martin Griffiths to the Yemeni port city of Al Hudaydah on Friday to encourage the warring sides to exercise restraint ahead of planned peace talks in December. A non-formal peace agreement was implemented in the city of Al Hudaydah throughout much of the week, which led to a decrease in battles being fought – although many breaches were reported. In southern Yemen, successful assassinations targeted UAE-backed Security Belt commanders in Aden and Abyan (for more on assassinations in south Yemen, see this recent ACLED piece). Also in Abyan governorate, an attack by suspected Al-Qaeda in the Arabian Peninsula (AQAP) militants at a checkpoint reportedly killed five Security Belt soldiers. Nadim Sana’ani, leader of the powerful Salafist Abu Al-Abbas Brigade active in Taiz, was killed in Aden city during a raid by ‘counter-terrorism’ forces. In Hajjah governorate, there was an increase in reported battles as Saudi-backed troops have surrounded the city of Harad, which is currently controlled by Houthi forces. Saudi-backed forces took control of the strategic Ahim junction early in the week and continue to push northward, taking control of Bani Marwan and Al-Hazn by Saturday. High fatalities were reported by both sides throughout the week. In Syria, rebel and Islamist factions continued their exchange of shelling with regime forces along the DMZ and in nearby areas of Idleb and Lattakia governorates. Meanwhile, clashes between Syrian Democratic Forces (QSD) and IS troops continued in the Hajin area of Deir-ez-Zor governorate. IS militants managed to make some advancement into the Al-Bahra area, however QSD troops, supported by intensive Coalition airstrikes, pushed them out by the end of the week. Turkish forces also continued their shelling of Kurdish People’s Protection Units (YPG) and QSD positions across the Turkish/Syrian border in the governorates of Ar-Raqqa, Al-Hasakeh and Aleppo. Finally, it was reported that alleged chemical attacks occurred in regime-controlled areas of Aleppo city on 24 November, with sources indicating that at least 32 civilians – and as many as 100 – experienced symptoms of suffocation. The regime blamed rebel groups in the area while the rebels denied their culpability and claimed it was a false-flag attack to justify possible offensives on rebel-held areas. The attacks took place just days before the next round of Sochi peace talks, scheduled for 28 November (BBC, 25 November 2018).